1932, Europe, also see Anton Bruehl, 1935. 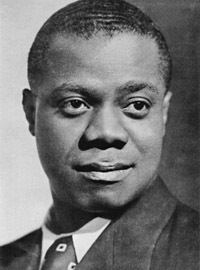 Born in New Orleans, the birthplace of jazz, Louis Armstrong is considered to be the most important improviser in jazz and one of the most important influences on twentieth century music. 1. Cf. Louis Armstrong, an American genious. James Lincoln Collier. New York : Oxford University Press, 1983. ISBN : 0-19-503377-9. hc. index. 383 p. for claims of an 1898 birthdate. 2. Notably in Celebration of the Craft, John Hamill, et al.. JG Press 1998. ISBN:1572152672. "...no such Lodge under the jurisdiction of the Prince Hall Grand Lodge of New York under the name of Montgomery Lodge No. 18. There is a Hiram Lodge No. 18, and this jurisdiction does not assign the same number twice to any other Lodge in its history." "Armstrong may have very well belonged to one of the many "bogus" groups operating in New York City, and there are scores of them, at least six Grand Lodges, none recognized by the Prince Hall Grand Lodge, he was not a member of the regular Prince Hall family."